It is about this time every year when things start to feel different. No matter how hard I try to pretend that it’s just another day, it never is. For most people September signals springtime and warmer weather to enjoy happy times. For me September is laced with sorrow, a reminder that another year without my lovely mother has gone by. I’ve stumbled through the predictable stages of grief during the past seven years. My heart remains laden with sadness and regret. This tells me I’m yet to reach the acceptance stage. What I miss the most is chatting with my mum. We talked about everything and would solve the problems of the world together. I always felt better after talking things over with mum. She made everything seem clearer and helped me find solutions to my dilemmas. As I can’t talk to her now I’ve decided to write mum a letter in the hope it helps me to admit my fears, release my regrets and find peace in my life. No one could have ever told me how much pain I would feel at losing you from my life. It was so sudden. We spent the day together enjoying life. That night you were lying in a hospital bed frail and broken, looking nothing like my beautiful mum. Your accident devastated Dad. He rapidly diminished with fear of losing his soul mate. When prompted for a decision about maintaining life support Dad respected your instruction and sadly agreed to have it switched off. I wanted to scream NNNOOOOOOOOO but remained silent. I wish I’d been brave enough to say I wasn’t ready to let you go . It would have prolonged the inevitable but selfishly I needed more time. For this I am sorry. After the medical staff disconnected the machines I wanted to stay by your side until the end, but after a while Dad wanted you left alone. I respected his decision and this is my biggest regret. Mum I walked away and left you alone to die. I abandoned you. For this I am sorry. My memory of your funeral is a blur of tears and pain. The image of your coffin occupies my mind and terrifies me in the darkest hours of the night when I lie awake. After you died I regularly visited your grave hoping to feel your presence. I never have. I always feel cold emptiness invade my body. I don’t go there much anymore. For this I am sorry. My long-term memories of you are joyful. Thank you for giving me life and always making me feel the most special person in the world. You were the glue that held our family together and since you’ve gone our sibling relationships have disintegrated. For this I am sorry. Lots of lovely things have happened in our lives since you’ve gone, I wish you could have shared them with us. Even though I can’t feel your presence I like to think you’ve been there in spirit. The truth is I feel like you have abandoned me. I believe your spirit exists but I can’t feel it and not knowing why is the worst feeling. Please come to me in a dream, land on me as a butterfly or blow in my ear. I need to know you forgive me and still love me so that I can find peace and let you go. Mum, I’m scared that as more years pass I won’t remember when you were alive. I’ve buried the truth of this story deep down for almost three decades and now know that in order to finally let it go I have to tell the world what happened to me. To people embroiled in personal tragedy or family breakdown I urge you to stay strong and believe that things can get better. No matter what happens I want you to know that you are a good person who is trying your best to overcome adversity. My story is sad and it hurts to write about but it has to be told to set me free and because it may help others going through similar circumstances. Everybody hurts sometime. My unhappy marriage unraveled in 1984 which filled my life with misery and insecurity. My husband was cruel and manipulative and blamed me for everything. Maybe he felt trapped by my pregnancy even though we chose to have a baby after six years of marriage. He was spiteful and ignored me by staying out late most nights. My self-confidence was so low I felt powerless. I was scared of being pregnant and alone so I put up with his bully behaviour hoping that when the baby was born he would change and our life together would flourish. I was timid and naïve and didn’t share my pain with anyone because I felt like I had failed in my marriage. Even my mother or best friend didn’t know what I was going through because I was ashamed to admit it. Being pregnant with my first child should have been one of the happiest times of my life but it was intolerable and for this I felt cheated. When our baby boy was born I was overjoyed even though my husband continued his disinterest. I was terrified of being able to care for the baby while coping with my husband’s unpredictable moods. My husband walked out of our life when our baby was seven months old. We had built a new house and he lived in it for three months before leaving. Even though I felt relief I also felt cheated out of the delight of sharing a baby and a new house together. There was no joy only pain. My baby was beautiful and continued to thrive each day. In the early days I put all my energy into loving and caring for him during the day and then lay in bed at night sobbing because I felt like a failure. Slowly my life began to recover and I discovered I was a much stronger person when I was away from my husband’s cruel comments. My self-confidence improved, my baby was thriving, I found a part-time job and I was re-acquainted with an old friend. After showing no interest in our baby boy for the first two years of his life my husband sent me a letter via his lawyer demanding weekend access rights to our son. This was followed by several stressful family court hearings and eventuated in having to send my two-year-old boy to stay with his father every fortnight. Nothing can erase the sadness I felt when I handed my baby to his father, who he didn’t know, for the first time. This was the start of 16 years of disruption and turmoil in my son’s life. As a teenager my son started playing up as most teenagers do but because he lived in two houses with two different sets of rules he began telling lies about his whereabouts. He disregarded his private school education and left soon after high school. The years that followed were dark and scary; I lost my son to drugs. I bailed him out so many times by paying money to people he owed. Each time he promised it wouldn’t happen again and said he would learn from it and turn his life around, but he never did. I loved my son but I couldn’t live with him anymore and watch him destroy his life as well as that of my family. He was angry, deceitful, uncommunicative and unreasonable. As much as it broke my heart I had to let him go when he was 18 to fend for himself. It took almost ten years before seeing any signs of improvement. There were times of intermittent contact and periods of no contact mixed in with lots of tearful situations. I managed to carry on living my life but always thought about my son and continued to believe that he would one day find his way to a better life. Every time he contacted me I told him how much I loved him, how I knew he could rise above his problems and create a better life for himself. He listened but counteracted everything I said with a negative response and my message never seemed to penetrate. This went on for many years. On Mother’s Day 2013 my son came to visit and he seemed truly happy and he looked healthy. It gave me hope when he genuinely smiled. I hugged him and he hugged me back for the first time in years and it felt like I was holding my son again. I felt his warmth and thought we may be coming out at the end of a long, dark scary tunnel. This was the first time he had said or written, “love you” in 16 years. His words and the warmth of his hug gave me hope that time can heal human suffering. I’m not saying everything will be perfect now but it was so nice to feel a brief moment of genuine hope with my son. That’s it; I am done with reliving the pain of my first marriage and past troubles with my son. I am ready to leave these hurts behind and from today I’ll only focus on the journey ahead in life. After writing this blog I am metaphorically putting my words on a water-lily and floating it in the ocean to be consumed by the universe to set me free. It doesn’t get any easier as the years go by. 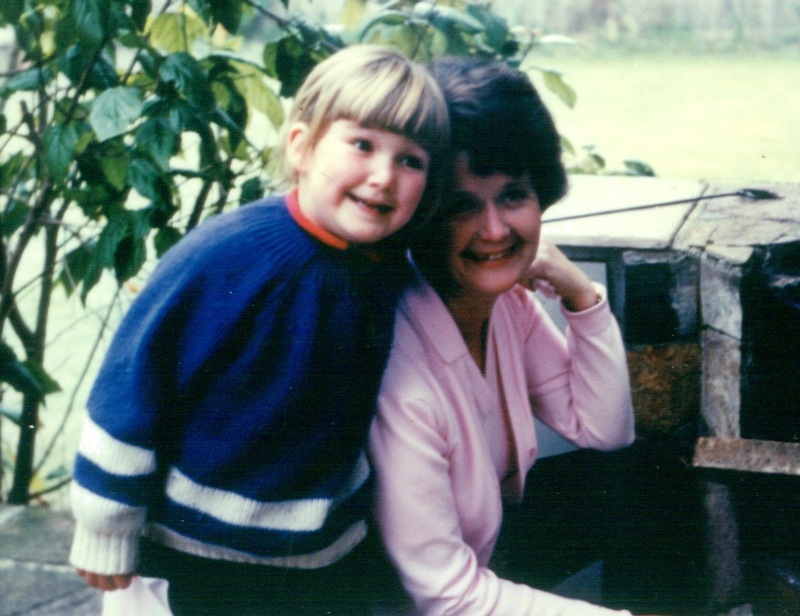 As the 4th of May approached for the seventh time since I lost my mum Joani I felt a familiar emptiness that bubbles to the surface every year on her birthday reminding me how much I lost when my mum passed away. 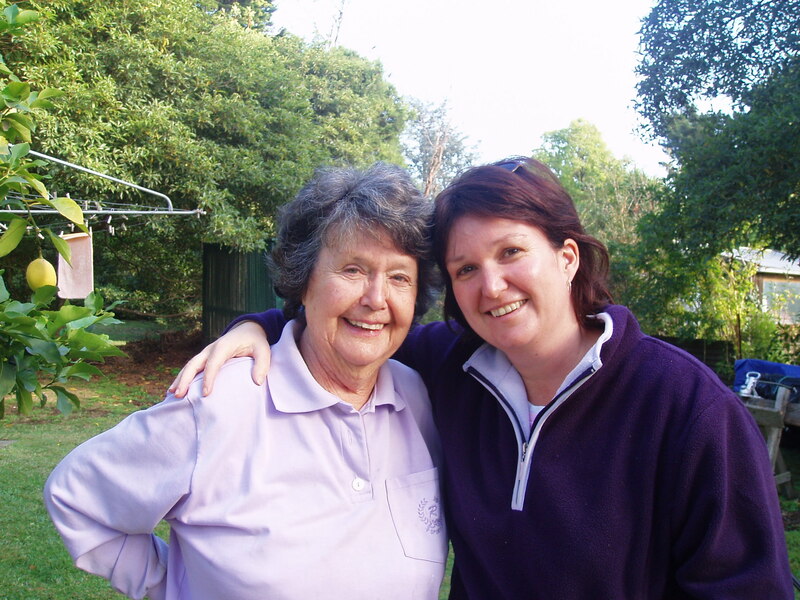 I knew my mum was ready to leave this earth but selfishly I wanted her to stay around for me. Joani accepted her fate when she died, she told me many times she didn’t want to be dependent on others like her own mother had relied on her. She said she wouldn’t place that burden on me. Even though my mum was okay about it, I’m not okay with it. I feel cheated by time. Leaving home to marry at a young age meant I didn’t see my mum often and life in my 20s and 30s disappeared in a whirlwind of raising a family and establishing a career. My mum was always a part of my busy life but I didn’t appreciate that our time was limited. All too soon I hit my 40s and ironically decided to cut back on my working hours the year my mum died. I wish I could have some of that time back to sit and talk to my mum who was always there for me. I wish I could hold her hand and feel her loving arms around me.